FLOWERY BRANCH, Ga. (AP) — Coach Dan Quinn knows the Atlanta Falcons‘ season is at a tipping point. Quinn’s other big issues are in the run game. With 26 net yards against the Saints, Atlanta had not performed that poorly since gaining 17 in a loss at San Francisco in 2015. It’s no better on the defensive side. The Falcons have been gouged by four premier backs over the last three weeks, with Nick Chubb, Ezekiel Elliott, Alvin Kamara and Mark Ingram combining for 439 yards and two touchdowns. There are other trouble spots, too. 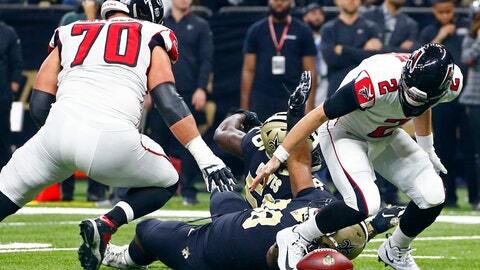 Matt Ryan leads the NFL in passing yards but he’s been sacked 33 times, fifth most in the league. During the three-game skid, he’s been hit 38 times, including 14 sacks. Safety Damontae Kazee’s six interceptions lead the league, but the Falcons are tied for 19th with nine overall. Cornerback Desmond Trufant, once considered to be the team’s best defender, blamed himself last week for having five dropped picks this season. He has yet to get an interception. Zane Beadles, signed a month ago to provide depth, could replace either Wes Schweitzer or Ben Garland as a starting guard, but Quinn said the team won’t address the topic until Sunday. With the Falcons’ biggest salary commitment to Ryan for $100 million guaranteed, fixing the line is imperative to Quinn. Quinn suggested the interior line weren’t entirely to blame against the Saints as Ryan was sacked six times and hit 13 others on 53 dropbacks. It’s hard to keep him upright when the run game is struggling so much. Defensive end Vic Beasley, defensive tackle Grady Jarrett and linebacker Deion Jones each declined interview requests with reporters on Monday. Reserve end Brooks Reed found hope in the Falcons’ ability to slow Saquon Barkley and Adrian Peterson in Weeks 7 and 9.